This whole blog is about doing things yourself and self reliance. Officiating your kid’s wedding saves money and adds to the special day. You get to do and say what you want within guidelines of the law. It’s my blog and I think this is important if you don’t like being at the mercy of others. This last weekend I performed the wedding ceremony for my daughter. It was a simple, beach wedding that was not very formal or elaborate. As a matter of fact, I made the bouquet and the veil that attached to my daughter’s Cabela’s ball cap….. I know. A bit redneck, but it was how she wanted it. 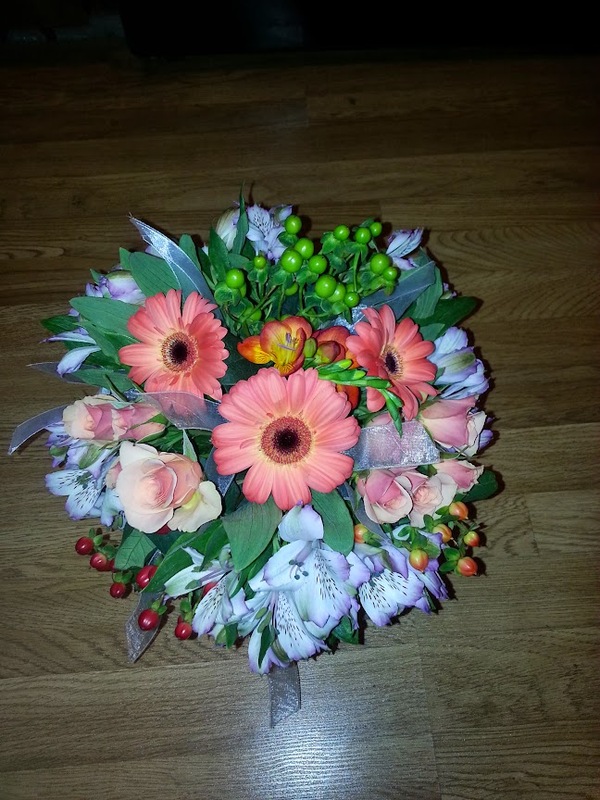 Just to show you how easy it can be to make a wedding bouquet I have included a picture of what I made for her. This was before I did the camouflage ribbon bow and dangle things off the handle. The whole thing cost me about $55 for the flowers, ribbons, green foam handle and cone shaped base that the handle slipped through. My daughter loved it and I was happy to have been able to make it for her. Many might not know it, but it only takes a few minutes and about $25-$30 to become an ordained minister with an online church. As far as the state we live in is concerned there are only a few requirements for the ceremony. Someone with a certain credential must officiate, such as judge or minister of any kind. Both parties must verbally agree to the marriage with witnesses present. A license must be purchased. That is it. If you can get those particulars covered, you can officially marry people. I went through Universal Ministries when I got my ordination. At the time that I got mine there was a few question quiz thing, but that is now gone. You just sign up and order your wall certification. Since there is a physical location for the church, this will actually pass as a regular ordination in most states. Some states don’t care. Just make sure to check your local laws. After the ceremony I did have to have some signature boxes filled in and will have to mail off the certification of ceremony completion. Seriously, it was so easy that I almost feel like there was something missing. The hardest part was figuring out what to say. What I did was go over the different lessons and advice that had helped make my marriage as strong as it is today. My wife and I will be married for 20 years this year and we have seen many marriages fail for any number of reasons. Having had the chance to council the kids before they did the wedding and then highlight the important pieces during the wedding is what I feel is a very important piece to their potential success. Marriages are so hard now a days that getting them off on the right foot and with realistic expectations is very important. I am hopeful and confident that I did get that across to them. For those of you who have ever considered conducting a wedding ceremony for someone, I really do recommend it. It was great to have been the one that stood up and married my daughter off to a great guy. I really was honored to have been able to do it, even though I was nervous as all get out! I wish my daughter and son-in-law the very best and really do suggest you step up and do something like this for your loved ones. It really will make the day that much more special. This entry was posted in DIY Projects, Miscellaneous and tagged bridal bouquet, DIY wedding, getting ordained, ordination, wedding, wedding bouquet, wedding ceremony, wedding planning on October 13, 2014 by Woodsbum.